I'm combining my two magnetized manicures for sake of time. And because I have pretty much the same thing to say. 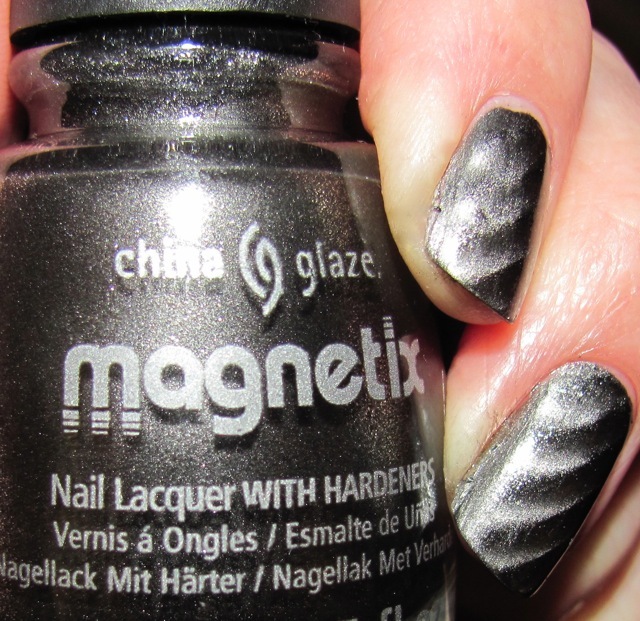 Here is my review of magnetic nail polish in general and my limited review of China Glaze Magnetix Collection. 1) I definitely like the magnetic craze. I think it's a fun, interesting idea for polish and nail art. 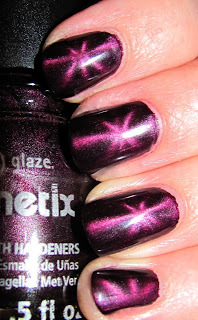 2) Magnetic nail polish is persnickety. It's definitely not something that I found to be quick and easy. Depending on your magnet size, nail curve, nail length, strength of magnet etc., it can totally affect your look. Some nails I retried over four times to get the look I wanted. I still wasn't always satisfied. 3) I normally am a HUGE fan of China Glaze. It is my number one polish. Love. But as far as wearability and usability, I was not very happy with my results. The magnet was weak and I had lots of trouble with magnet application. My polish chipped really fast--some less than 24 hours (unlike my Layla Magneffects, which is some of the longest wearing polish I have ever owned). What I did like better than Layla was the closeness of the diagonal stripes of China Glaze's magnet. Both colors were at least two coats (sometimes three depending on if the magnet worked to my liking) and had a top coat of Seche Vite. ooh, I love the starburst! I was not impressed the the CG magnetix either. The colors were nice, but everything else was not my favorite! I actually loved the magnetic polished from Icing & Claires, which I didn't think I would. Thanks Jenny! I wish I was a more exciting person on Twitter, but I'm not!